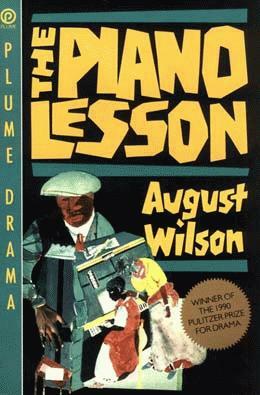 After several conversations with different colleagues about magical realism in African American literature, I was pointed to this particular play by more than one person. I finally found the time to read it. I have to say that I was disappointed that it wasn’t more unusual (I guess that’s just me — I love stuff like Tropic of Orange and The Heirs of Columbus for the unusual style and tone that such works exhibit), but I enjoyed it very much.The piano itself is an interesting and key element in the drama, so I’ll start there. The carvings representing the family’s ancestors are interesting in the way they blur the lines between art and life — since they sometimes appear to be the actual people they were carved to represent, there’s an interesting phenomenon at work here. At the same time, there is so much happening in this play that makes the reader question what’s really happening and what’s not that I sometimes couldn’t tell what was there and what was in the minds of the characters.Then there’s Sutter’s ghost. I think it’s really interesting that it is the ghost of the former slave-owner who appears to this family instead of someone…hm…someone less hostile? More friendly? I wasn’t quite sure how to take his repeated appearance and the playing of the piano that it ultimately necessitated. Is this to say that the former slave-owner is still looking out for this family and has their best interests in heart, therefore the playing of the piano is a good thing? I hardly think that can be the intended message. Is it that in order to rid the family of the former slave-owner, who continues to haunt them even in freedom, they must go on with their lives as they would have as if slavery never existed? This also seems implausible. So I think some of these ideas are relevant, while others are most likely not.I guess what I really have to say is that this drama was interesting and left me with a lot to think about. It’s the first drama I’ve read that could really be considered magical realist, and I am curious about what else I might discover if I explore magical realist drama further.